In this day of permanent press and knit fabrics that rarely wrinkle, the use of the iron is almost obsolete. But the skill of ironing was once an important one that young girls learned from their mothers. I was one of those girls! With the interest in both buying vintage clothing and sewing using vintage patterns, a look at the art of ironing as it was experienced in decades past seems worthy of a review. When I was very young, ironing did not simply "just happen" in the sense that it can be done today (from the dryer to the ironing board to the closet). 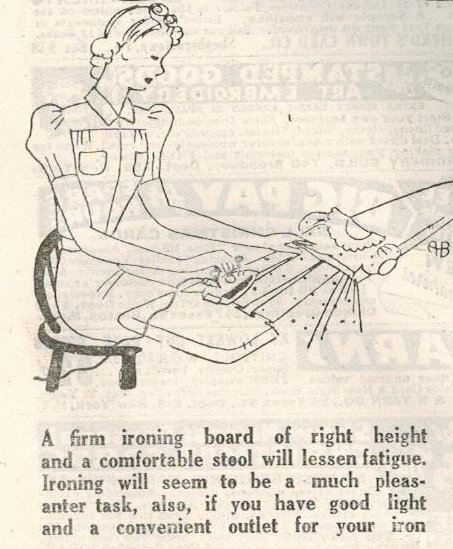 In decades long past, ironing took more planning. Using images from an article "Iron without Ire" in a 1939 edition of Home Arts magazine, I will describe the steps involved. 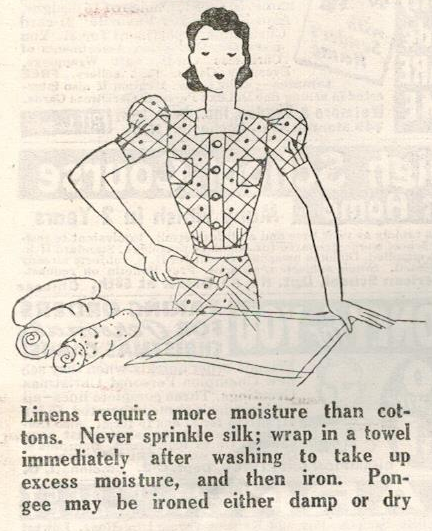 And I can tell you, the methods described here stayed pretty much the same well into the 1960s, at least until "permanent press" fabrics and the steam iron became the standard. I speak from personal experience! Step 1: Starch garments that need it. To get a crisp finish you needed starch. In fact, dry cleaning establishments sometimes will still ask if starching is required for cotton or linen shirts (to add stiffness to men's shirts, for example; and it is the collar and cuffs that are really the parts that need the starch). Today you can still buy spray starch, but way back in the day you had to mix powdered starch (cornstarch will do) with water, and then spray or sprinkle on the clothing. This is a critical step! This step is what steam irons today have eliminated. I can still remember watching my older sisters and mother sprinkling clothes and wrapping them in a towel (and I did it myself). Usually a sprinkling head or stopper was put on top of a pop bottle - it worked great. Usually the clothes had to be sprinkled and wrapped at least several hours or a day before they were ready to be ironed. You have to remember that most clothes were line-dried until the advent of the automatic dryer. So clothes were dry and stiff. In order to iron them, making them just the littlest bit damp made the ironing so much more effective. Drying a damp item with a hot dry iron was the equivalent of applying steam. I don't think we ever sat at the ironing board, we always stood. I don't know whether that was a preference or a matter of the ironing board not being adjustable. 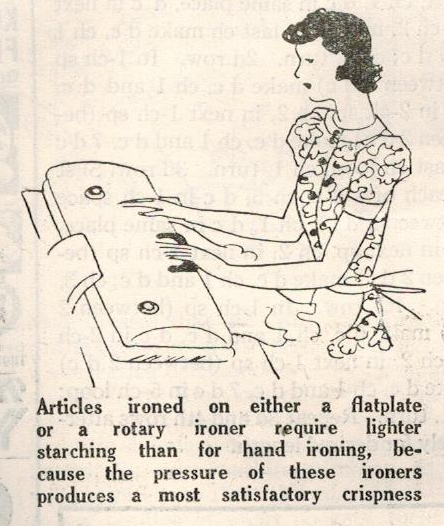 In any case, the ironing board always came to a rounded point (the end from which you ironed). The ironing board should be padded and covered. For pants, iron the waistband, then iron one leg at a time. Fold the leg to match the inseam to the outseam, then press. Press a crisp or soft seam (center front and back) as desired. If you are serious about learning how to iron, there are YouTube videos that illustrate the techniques, so be sure to check them out. This is the supremely perfect instrument for ironing sheets, tablecloths, towels, and other linens. Can you imagine ironing your sheets? We never owned one when I was growing up. We did have a neighbor, however, who did. One day she actually showed me how to use it and let me iron an item! It was a manual feed and I thought it was exotic and very cool! Oh, gosh, Brigid. I'm so glad you enjoyed it. :) I'm not sure, sometimes, if anyone even uses an iron anymore! :) But it's an interesting bit of history, I think. I still use an iron sometimes, though I'm definitely not THIS skilled! I didn't know a lot of this stuff. I now have a steamer, and I generally use that instead of an iron if I can get away with it because it seems to be a bit safer for my vintage clothes. Be grateful for your steamer, Emileigh! There was no such tool when I was your age. 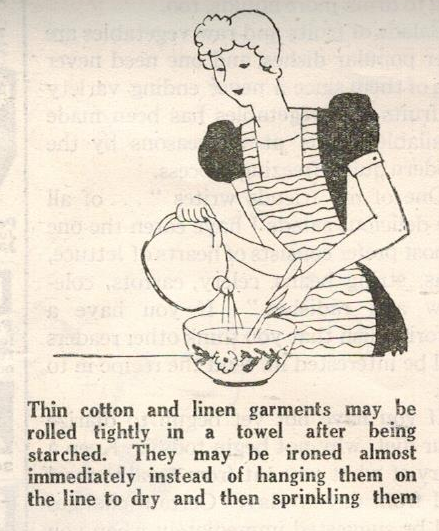 ;) The methods for ironing were definitely more labor-intensive in decades past, and I can't say that I mourn them. Although I DO find it interesting that iron mangles are still made and sold (pricey! ).